Tune up the band for some Sweet Chin Music — it’s time to get a look at the official cover artwork for “Shawn Michaels: The Showstopper Unreleased”. 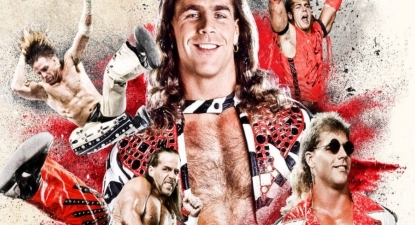 Last month WrestlingDVDNetwork.com exclusively revealed the full list of never-before-released HBK matches that WWE is set to unearth on this anticipated 3-disc DVD collection. Now, courtesy of WWEDVD.co.uk, comes the planned box artwork and with it confirmation that the UK release is locked in for October 1st, 2018, one day before the US version hits stores. That content listing we spoke of is made up of 35 full-length matches; that’s 8 hours of hidden gems and will include a brand new interview with the man himself! “Shawn Michaels: The Showstopper Unreleased” is HBK as you’ve never, ever seen him before with a mix of rare and scarcely seen matches from all stages of Shawn’s career between the years 1985 and 2009; footage from Mid-South Wrestling, the AWA, and loads of unseen WWE dark matches and live events! You can check out the newly-revealed artwork below and click it to see it SUPER-SIZED. – UK/Europe: October 1st. Pre-order the HBK Unreleased DVD soon via Amazon.co.uk. – USA: October 2nd. Pre-order the HBK Unreleased DVD now here on Amazon.com. – Australia: TBA. Your pre-order opportunity is due to go live soon over at Madman.com.au.  Grab some WWE DVDs for only $5 & $10 NOW!! 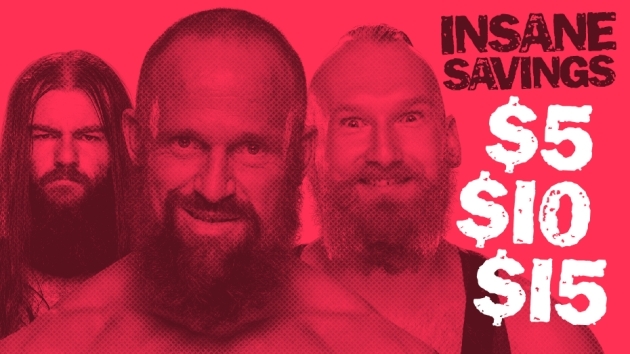 Wallets out, WWE is running another “$5, $10 and $15” sale on hundreds of products this week from T-Shirts to masks to Pop! Vinyl figures to, of course, DVDs! A few goodies spotted in the DVD deals include the Kevin Owens documentary, the Kurt Angle collection, and the latest NXT release. Head on over to WWEShop.com before the early hours of Friday morning to take advantage. ❗ NOTICE: Some comments had to be removed on recent articles due to arguments and insults made without any sort of relevance to the topic. If it doesn’t cool down you might find yourself with comments automatically flagged for moderation so they won’t show until approved. Nobody wants that. Removal of comments like this and the extra moderation involved means more work for the WDN staff and less time put into the stories we aim to deliver. We preferred having the trust to leave you guys to your own devices and comment responsibly without intervention. Didn’t you? Stick to the topic, be friendly. DVDs vs. Blu-rays… well, at least that’s sometimes on topic but keep in mind WWE is only releasing WrestleMania on Blu-ray domestically and that isn’t changing, so the debate doesn’t mean a great deal at this point. On topic but going out of your way to be overly negative to evoke some sort of reaction from other commenters? No go either. The above will apply in this case too. Trolling? Playing a character? Not in our 8-year-strong community. him in the different stages of his career. I guess they feel unreleased content is enough to sell the set and that’s true enough, at least so far. But still can’t help but feel it’d be nice if they were 4 discs even if the 4th were a bonus disc on limited edition or special edition versions of these sets only. I’m saying 4 bc I find that more realistic than 5 discs. That art cover is lit. I can’t wait to get my hands on this dvd when it come out. PRE-ORDERED! THE BEST THERE IS THE BEST THERE WAS THE BEST THERE EVER WILL BE! Someone’s looking for a reaction. Yeah not the best attempt ever to get some attention. Yes because I refuse to put Shawn over, lol. I didn’t appreciate what you said about Rollins and Joe, Bret. They couldn’t lace my boots. I never hurt anyone, thats why I’m the greatest of all time. It’s a nice cover but I’ll pass on the set. I think there’s enough Shawn Michaels material and DVDs out there. Now that Hogan is back with the company, maybe a Hogan Unreleased set with TV taping dark matches. Nah, they already done an unreleased set on him before and even that was kinda boring at times. How is a Hogan Unreleased set a priority when there has already been one and many other main eventers have yet to have one? No one said it was a ‘priority’. Just someone expressing an opinion. If it was released now, that would be prioritising Hogan’s second Unreleased set over others. The 2nd set would be a mix of TV matches, house shows, and TV taping dark matches never released before which wasn’t present on Hogan’s last set. The perfect title can be Hulkamania Unreleased the Unseen Matches of Hulk Hogan. Idk if that’s a wise idea. 1. He got an unreleased already. 2. Other top talent haven’t. 3. There’s backlash already as it is – understandably so – regarding his re-insertion into the HOF. I’m starting to agree! I think that an ‘Undertaker Unreleased’ set would be great watching! Shawn Michaels & Stone Cold being my favourite superstars, we have this Michaels Unreleased coming out, though I think I’d only prefer seeing an Austin Unreleased on most of his ‘Attitude Era’ matches! Same w/Kane – matches from his debut – the Attitude Era! Definitely an Undertaker Unreleased set would be amazing! He’s one of the most requested dvd projects as far as an unreleased set and a documentary set. I know bc I’m one of those who’s constantly requesting it to WWE via social media. I can understand your points on Austin and Kane. Though I don’t agree w/it as far as Kane goes. Agreed but I think the awesome cover is good enough and represents the important parts of his career or that the cover reflects the parts of his career that are represented in the contents of the set. Wow, that’s an awesome cover. Kudos to the home video department! Best cover I’ve seen in a long time. Love it! You know, above with the artwork it also states, ‘Now, courtesy of WWEDVD.co.uk, comes the planned box artwork’. However ‘WWEDVD.co.uk’ still haven’t shown the ‘Shawn Michaels Unreleased’ set yet! “When on earth…”? Why are you so tetchy about it? It will go up soon, chill! Do you have to have the set by a certain date or something?! You’re right. I just thought that it may have been today since the front cover has been given by courtesy of wwedvd.co.uk. Absolutely love the artwork. I feel like they really tried on this one. Couldn’t agree more. Good colours/design and iconic pics of HBK doing what he did best. Someone at WWE still cares about DVD artwork! You are so impatient. It will be shown soon, don’t fret! Definitely! I really like it. while I don’t feel like that artwork is spectacular, it’s not too bad either.